Your Central Hub for the Latest News and Photos powered by AirlinersGallery.com Images. Airline Videos, Route Maps and Aircraft Slide Shows. Framable Prints and Posters. OLT Express (Germany) (Bremen) has been sold by Amber Gold to Dutch financial investor Panta Holdings BV. Under the leadership of Panta Holdings, OLT Express (Germany) will continue its expansion plans by integrating Contact Air (Stuttgart) in early September. Panta Holdings has been active in the aviation industry with Dutch company Denim Airways and leasing company Mass lease. In addition, Panta is involved in the Canadian supplier Avcorp Industries. Panta Holdings also owned VLM Airlines in the past before it was sold to the Air France-KLM Group. After Amber Gold announced it was getting out of the aviation industry after the recent failure of OLT Express (Poland) there was a period of uncertainty for the employees of the OLT Express (Germany) and Contact Air. Now they have a more secure future. Copyright Photo: Andi Hiltl. The Fokker 100 will now be the main aircraft for the new OLT Express. Fokker F.28 Mk. 0100 D-AOLG approaches for landing in the bright 2011 livery at Zurich. Unfortunately this color scheme is now also associated with the failure of OLT Express (Poland) which made headlines when it stranded passengers. A new branding effort by the new owners could become a new reality. This entry was posted in Contact Air, OLT Express (Germany) and tagged 11452, aviation, aviation industry, Contact Air, DAOLG, F.28, F.28 Mk. 0100, Fokker, Fokker 100, Fokker F.28, Fokker F.28 Mk. 0100, OLT, OLT Express, OLT Express (Germany), transportation, ZRH, Zurich on August 9, 2012 by Bruce Drum. OLT Express Germany (Bremen) took over the operations of Contact Air Service GmbH & Co. KG (Stuttgart) on July 4. 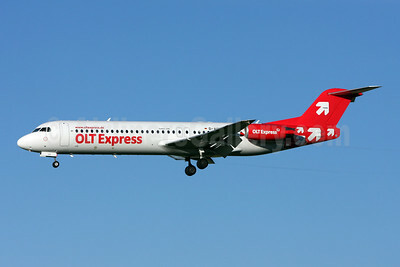 Both companies will continue to operate under the OLT Express brand. Anti-trust clearance of the acquisition is expected to be completed in early September 2012. With the acquisition, OLT Express Germany now employs about 500 additional employees. Of these, there are approximately 200 employees in Bremen, about 200 in Stuttgart and about 100 in Saarbruecken. Top Copyright Photo: Andi Hiltl. Bottom Copyright Photo: Rolf Wallner. This entry was posted in Contact Air, OLT Express (Germany) and tagged 11452, 11517, aviation, Contact Air, Contact Air Flugdienst, DAFKA, DAOLG, F.28, F.28 Mk. 0100, Fokker, Fokker 100, Fokker F.28, Fokker F.28 Mk. 0100, Fokker F28, Fokker F28 Mk 0100, OLT, OLT Express, OLT Express (Germany), transportation, travel, ZRH, Zurich on July 20, 2012 by Bruce Drum. Lufthansa Airbus A320-211 D-AIQM (msn 268) (soccer nose) LHR (Antony J. Best), originally uploaded by Airliners Gallery. Lufthansa (Frankfurt) will add new service to Moscow’s Vnukovo Airport. The twice-daily flights from Frankfurt will supplement the airline’s existing services to Moscow’s Domodedovo Airport. 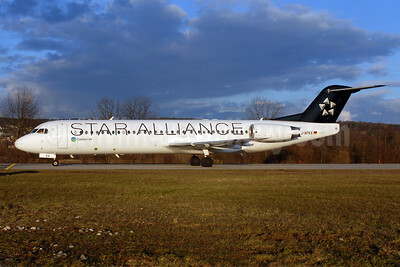 The new route will be added on March 25, 2012 and will be operated with Airbus A320s. In other news, Lufthansa is reportedly ending its Lufthansa Regional contract with Contact Air (Stuttgart) in October 2012. Contact Air currently operates six Fokker 100s for Lufthansa and a pair for Swiss International Air Lines. Contact Air became the first partner airline in the Team Lufthansa regional group in April 1996. On October 16, 2003 Contact Air introduced the Lufthansa Regional brand and began operating as Lufthansa Regional in early 2004. Copyright Photo: Antony J. Best. This entry was posted in Contact Air, Lufthansa, Lufthansa Regional and tagged Contact Air, Lufthansa, Lufthansa Regional on November 30, 2011 by Bruce Drum. Contact Air’s (Stuttgart) Fokker F.28 Mk. 0100 (Fokker 100) D-AFKE (msn 11505) made an emergency landing at Stuttgart this morning due to landing gear problems. The passengers and crew escaped using the emergency chutes. The incident made headlines in Germany because one of the passengers on board was the chairman of Germany’s Social Democratic Party headed to Stuttgart to make a speech. This entry was posted in Contact Air and tagged 11505, Contact Air, D-AFKE, F.28, F.28 Mk. 0100, Fokker, Fokker 100, Incident on September 14, 2009 by Bruce Drum. BBC: Cathay Pacific to crack down on "pilferage"
Airliners Gallery Digital Photo Library Our flagship digital photo library. Aussie Airliners A superb collection of great photos from Australia. Aviation Branding Weblog The latest airline livery news and designs from Lila Design. HNL RareBirds The latest aircraft movements from Honolulu. The Planeboys (Berlin Airports) The latest news and movements at the Berlin airports. Weather (United States – National Weather Service) The National Weather Impact Map. World Clock – Local times by city Times and conditions at world cities. World of Aircraft Pictures 2013 The latest aircraft photos from Zurich. ZIpanguFlyer (news from Japan) The latest news from Japan.